We had breakfast, with myself making sure only to eat lightly because I had planned to do the low impact aerobics class at 9.15 am. I looked longingly at the pastries that I couldn’t eat and decided to get one of their takeaway containers to put 2 pastries in so that I could eat them for morning tea. Nice 🙂 I found it very strange that most of the exercise classes were very early in the morning, starting with a power walk up the mountain at 5 am to see the sunrise from up there. Not a pretty prospect in the weather we endured; I can imagine stepping on frogs enjoying mud baths in the dark and it’s not for me thank you very much. Neither is getting up at the same hour we would normally be going to bed when you take into account the 2 hour time difference between Queensland and Perth. There was another class at about 6.30 am and others during the time that breakfast was being served. I’d much rather they were mid-morning or mid-afternoon. While I’m on that subject we found it very difficult to see what activities were on at what times. There was a noticeboard in a prominent position but it was so fragmented in the way it was displayed that we were still discovering things on the day we left. They need someone with my organisational skills in that office tee hee! I’d love to have seen one large sheet for each day of the week with times listed chronologically down the left-hand side and the available activities next to each hour. What they had was 1 piece for each day of the week but it only showed a few activities and the theme for the evening meal. There were about 6 other pieces of paper for various topics such as sports, water sports and I don’t know what so that you had to cross-reference between them all and it was thoroughly confusing for someone in holiday mode who wants all information spoon-fed clearly. We missed a few activities that we’d have liked to do because we didn’t notice them hidden off to one side. But I digress, and I don’t hear any shocked noises in response to that!!! The aerobics class was run by a lovely energetic and friendly girl named Angie and I was her only client. 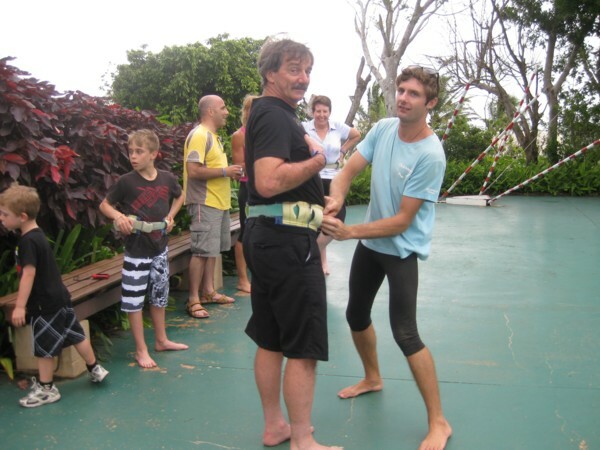 It was cute doing an aerobics class with just the 2 of us face-to-face with an audience of one, David. It was a low-impact class and seemed much too gentle in comparison to my usual bootcamp that I do each week but in the humidity the sweat was soon pouring off me so it was probably just as well not to be exercising harder. Half way through the class I suddenly felt guilty, realising that if I hadn’t showed up Angie could have had a rest and some time off instead. I apologised and she assured me that she was happier to have done the class. I did still have spare energy at the end of the class though so I dragged David to the steep hill near the jetty and we set out to walk as fast as we possibly could up it. We slowed to a gentle pace for about 20 metres once it flattened out, to get our breath back, and then ran and walked alternating all the way up to the archery. Now what? We saw the tennis courts with only one of them in use so decided to have a game. I had done tennis lessons in high school – says May, snorting with laughter! I’d had 4 lessons and 3 of them were spent on how to hold the racquet! I served from the half-way-down-the-court line as I doubted I’d get the ball over the net if I served from the base line but we soon got the knack of things and I began serving from the base line. We had great fun, trying just to volley to one another for the most part, and spent a very happy 45 minutes or an hour playing until we’d both had enough. Already it was heading for lunch time so we went to shower first and were joined at our lunch table firstly by Steve, the village manager, who was really interesting to speak with. He originally came from Colombia; I don’t think I’ve met anyone from there before! We told him what a wonderful staff team he had, we loved them all. After he had to go we were joined by Grace, a lovely girl who was working in reception. Straight after lunch I could see the juggling lessons going again so asked if I could have a hula hoop and the G.O. kindly went and got one for me; he hadn’t expected anyone to want one so hadn’t got them out prior to my asking. This was my third try, I’ve missed mentioning my second try but neither of these lessons had Monica teaching so I only went backwards with my skills. Part of the trouble was that I was quite bruised by now – the back of my hand between my thumb and first finger from spinning it on my hand; my left knee – actually that was already sore from a fall a week before so I was very wary of hurting it more, and my left ankle where the hoop always seemed to hit before falling all the way to the floor. But I loved it so I kept going long after it would have been sensible to stop. 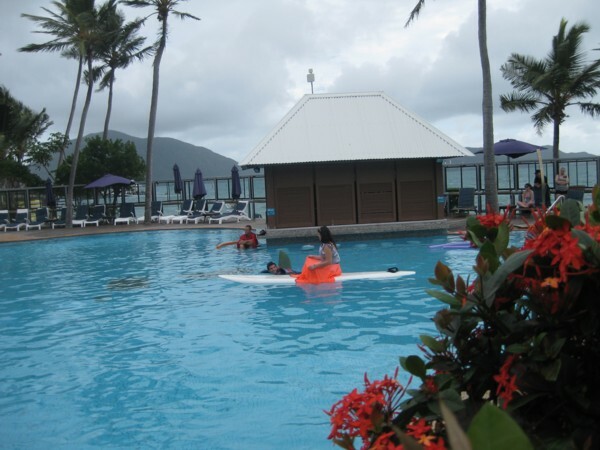 We walked past the main pool during the afternoon and were amused to see our poor Glenn in there wearing a shark fin on his back as a part of a story being told over a loudspeaker. The ‘princess’ on the surfboard could scream louder than anyone I’ve ever heard and the unfortunate shark was seen to put his fingers in his ears. I don’t blame him! We were too close to that noise for my liking and were a good two metres further away than he was! The weather continued to be extremely windy and even the kayak and catamaran lessons were all cancelled. Had we been keen to do one of these, and I think we would have tried once at least, it was out of the question with the rough conditions. You won’t catch me doing anything that would mean getting a mouthful of ocean water and David is no more keen than I am at getting dunked amongst potentially stinging creatures. In fact he gets very unhappy by being out of his depth too. We went back to our room and David declined my kind offer of playing one of the dice games we’d taken with us so I read for a while and he watched the TV but soon got edgy and disgruntled at spending our holiday this way so we went for a hill climb once more and explored behind the conference room. 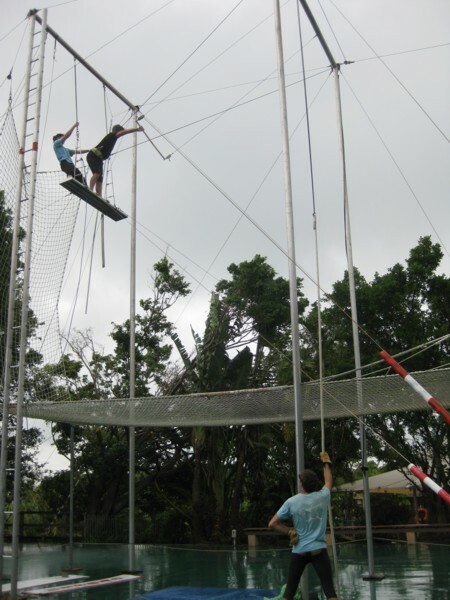 It just so happened that the trapeze school was in session at that time so we went for a look. There was our Monica, high above the ground on a small plank, assisting people to get on the trapeze and Byron was on the ground hanging on to their safety harness and yelling out instructions. It was great watching people trying out their skills and then one lady asked us if we were going to have a turn. I replied “I definitely won’t, but I think David would with a little persuasion”. And he did! Looking a little apprehensive, here he is letting Byron put the safety harness on him but as soon as it was David’s turn he shot up the ladder like an experienced monkey and hopped onto the high plank without a second thought. He had to wait with Monica until she pulled the trapeze towards him and he could only reach it with one hand to start with. Then she grabbed hold of the back of his safety harness and told him to lift his feet. Yeah right. Had I made it from the ladder to the plank, which is highly unlikely, there’s no way I’d be removing my feet from under myself at that height but David did as he was told while she virtually held his weight by the waist harness. He could then reach his second hand to the trapeze and off he swung. Byron was calling out instructions to David and we were both shocked when the next instruction was to bring his legs up through his hands and tuck his lower legs over the bar. And then to let go with his hands!!! So here he is, dangling head-first towards the ground. OK, through a safety net, but he is definitely my hero – as usually happens at some point during a holiday. Soon after David dismounted the dark clouds and strong winds delivered the expected; heavy drops of rain. As everyone bolted for the circus hut, Byron yelled out to Monica “Stay up there. I don’t think the rain will last so we should be able to keep going!” And she made a gasp noise that can’t be typed. Poor thing!!! It rained enough to thoroughly wet, but not drench the ground, but up where Monica was we could see how hard the wind was blowing her. I guess she was being blow dried but it must have been so cold! 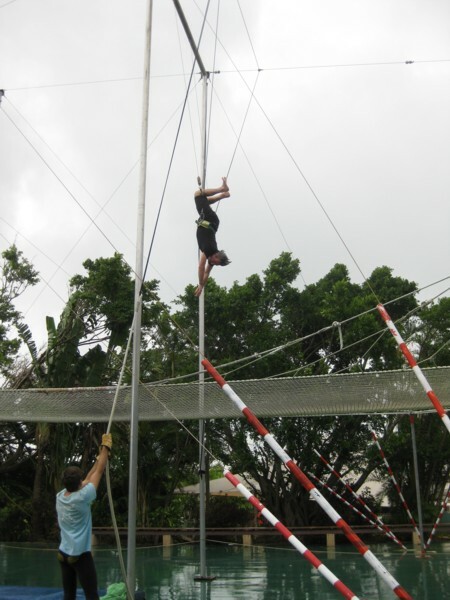 Quite quickly the rain stopped though and the few participants had another go on the trapeze each. I took video of David this time but he struggled and couldn’t get his legs hooked on this time so it isn’t worth sharing it. Some of the other guests had moved on to quite advanced moves such as hanging upside down doing the splits and then another G.O. 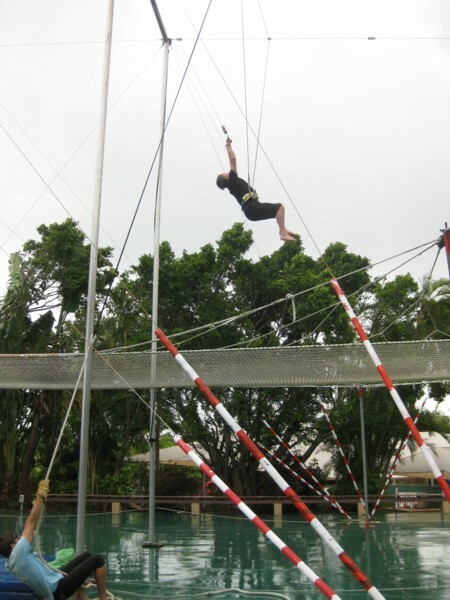 clambered up a rope to the right and attached another trapeze. He then hung upside down from this and started catching the more advanced students. It was very impressive to watch. I forget now whether the session ended because time was up or the rain came again but we went back to the main entertainment area anyway. We decided to play a game of ping pong so David went to the shop and paid the 50c for a ball which then became ours for life. It was fun to play again and this was now the third sport we’d played after many years’ break – golf, tennis and ping pong. After this we decided to go to the shop and buy David a souvenir t.shirt as well and he chose, with my guidance (LOL) a burgundy coloured one with a white 88 on it. Burgundy suits him very well. Tonight’s dinner was Italian themed and the dress code ‘elegant’. I wore a cream all-in-one trouser suit with strapless top but had forgotten to take the special bra that I wear under it so had to play some games with tissues to protect my modesty hee hee. 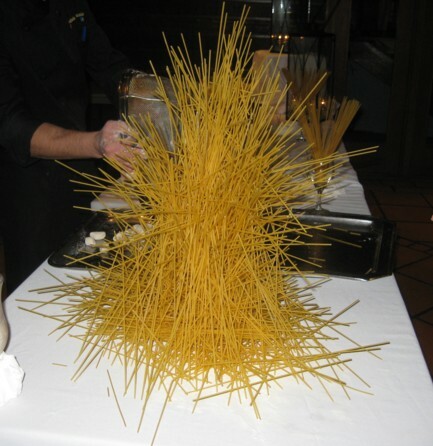 I loved the spaghetti sculpture that greeted us just inside the door adorning a table where a chef was adeptly making fresh gnocchi. Our G.O.s to join us tonight were the lovely Ash and Alisha and we enjoyed their company as we had the others before them. There were more birthdays tonight as there had been every night since David’s. It’s amazing that there had not been any before his but it was lovely as it meant his had been a total surprise to him right up until the cake landed on the table. The show tonight was a tribute to Broadway with yet again some great talent and innovative costumes. Some of the tunes we recognised and others we did not. After this and the little dance session they held a Casino Night in the bar which was great fun. We were all given a paper cup with some chips in it and I spent the night playing twenty one after watching one of the chefs to see how it was played. His name was Joseph and he was a new employee too. He’d just arrived from Las Vegas – truly! Towards the end of the night David started to play as well and when they called Time we had 72 chips between us. We were very proud! Everyone’s chips were given back and we were all given a few raffle tickets. There were 2 prizes, a bottle of champagne was first prize and second prize was breakfast in bed delivered by 2 G.O.s of your own choosing. We did not win either. Towards the beginning of Casino Night the wind blew the rain so hard that it was coming through the open windows 2 metres into the room! David fought his way towards the windows and shut them quick! We did not have an umbrella with us – any left at the door were free for anyone to take – so it was a very cold and wet journey back to our room! I thought you went on holiday for a rest LOL. He was great, I never doubted him. He used to work on 2-storey rooves all the time and scamper up and down the ladder and across the roof before the tiles were on with no fear at all, just sensible precaution.